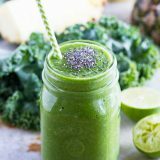 Filled with lots of good for you ingredients, this Pineapple Banana Kale Smoothie Recipe is filled with iron, potassium, fiber and so much more. And it’s so delicious, even the kids will love it! Blend the kale and the water in a blender until smooth. Add the remaining ingredients and blend again.